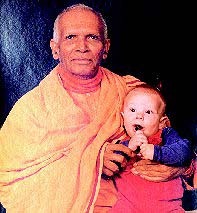 With profound sorrow we announce the Mahasamadhi of Srimat Swami Ranganathanandaji Maharaj, the thirteenth President of the Ramakrishna Math and Ramakrishna Mission, on 25 April 2005 at 3.51 p.m. Most Revered Maharaj was ninety-six. Tell that boy (swimming in the river) this is not Malabar, said the venerable old sadhu, standing on the balcony of the Belur Math building overlooking the ghat on the Ganga. His radiant face was beaming with affection. The old sadhu was none other than Srimat Swami Shivanandaji Maharaj, popularly known as Mahapurush Maharaj, a direct disciple of Sri Ramakrishna and the second President of the Ramakrishna Math and Ramakrishna Mission. The boy - with whom swimming was a passion - was his seventeen-year-old disciple Shankaran. In retrospect, Mahapurushji had good reason to be solicitous, for Shankaran was destined to have an illustrious career as a monk. Having initiated him into spiritual life with mantra diksha in 1926, Mahapurushji was to confer the brahmacharya vows on Shankaran Kutty in 1929, naming him Yatichaitanya, and later, in 1933, invest him with the sublime sannyasa vows, following which he came to be known as Swami Ranganathananda. Teachers of Vedanta who brush away all names and forms while describing reality are, paradoxically, fond of using mundane illustrations to drive their point home. Two common but powerful motifs are the sun and the lion: the sun of Knowledge and the lion of Vedanta. Swami Ranganathanandaji possessed a luminous mind shedding the lustre of Vedantic knowledge and the heart of a lion - fearless, noble. He also embodied the Vedantic qualities of childlike simplicity, unstinting universal love and same-sightedness. Maharaj was born on 15 December 1908 in Trikkur, a small village near Trissur in Kerala. As a young boy he was always bubbling with energy. He later said: ’Love of adventure and dislike for easy life, and the German philosopher Nietzsche’s dictum ”live dangerously” have been with me ever since (childhood).’ Even at a tender age his keen and perceptive mind reacted to the virus of untouchability, then ubiquitous in Malabar. He made it a point to break caste distinctions. When he was about fourteen, Sri Ramakrishna entered his life through The Gospel of Sri Ramakrishna and he was never the same again. Religion now became palpable. The Complete Works of Swami Vivekananda, which he read subsequently, further revolutionized his mind and determined the future course of his life. The spiritual fire of his soaring young soul was stoked when he was initiated by his guru, who was then in a high spiritual state in Ootacamund. The initiation also testified to an earlier mystic dream the young boy had had about his guru. His young but mature soul naturally responded to the higher call of renunciation, service and God-realization, and in 1926 he joined the Ramakrishna Order in Mysore. As a young boy he once uttered some bad words, picked up at school, in front of his mother. She reprimanded him saying: ’My boy, your tongue is the abode of Vani, or Saraswati, the goddess of knowledge and wisdom. Don’t soil it by using foul language against others.’ These words penetrated deep into him. His speeches in later years testified to the fact that Saraswati was truly seated on his tongue. The first twelve years of Maharaj’s monastic life, spent at the Mysore and Bangalore Ashramas, were days of hard work, study and meditation. He was involved in a host of Ashrama chores - from cooking and dishwashing to supervising the Ashrama hostel. He loved hard work.’ I have never known tiredness in my life,’ he would say later. Amidst the busy routine, he also found time to memorize the Gita and the Vivekachudamani. He would recall this whenever someone complained about being too burdened with work to make time for oneself. Swami Ranganathanandaji’s phenomenal mental acumen and memory were a revelation to many - even scientists. His sharp intellect and tempered devotion set him apart from the ordinary. He avidly and intensely studied not only Indian scriptures and mythology, but also those of other religions. In his intellectual journey, he traversed through the minutiae of Eastern and Western philosophies, the various branches of science, history, sociology, psychology and economics - in fact there was no field of knowledge that he did not touch. His intellectual appetite was so great that even ordinary subjects received his attention, not to speak of scientific discoveries and social trends, with which he kept himself abreast till the very end. The development of his brain was complemented with his athleticism. He exercised regularly and was agile and vigorous. Even in his seventies, Maharaj could be seen playing volleyball, leaping and smashing the ball like a young man. His missionary activity reflected a wonderful blend of ancient wisdom and modern science. He had commenced addressing prisoners on ethical and spiritual life in Mysore Jail in 1933-34, and this he continued in Bangalore, among the youth, where he moved in 1935. After Bangalore, Swami Ranganathanandaji was Secretary and Librarian at Ramakrishna Mission, Rangoon, Burma, from 1939 to 1942. When Rangoon had to be evacuated in the face of an impending Japanese invasion, he chose to return to India on foot along with thousands of other refugees, braving untold dangers but yet helping many on the way. During 1942-48 he headed the Mission’s Karachi centre. His lectures there were very popular and were attended by all sections of society. Following the closure of the centre in the wake of the Partition, he was sent to head the Ramakrishna Mission in New Delhi between 1949 and 1962. This period turned out to be the most fruitful in the centre’s history. Apart from helping the victims of the Partition who were temporarily sheltered near Delhi, Maharaj built a temple, a students’ library and an auditorium that used to be packed with the city’s elite during his lectures. During 1962-67 he was in Calcutta as Secretary of the Ramakrishna Mission Institute of Culture and Director of its School of Humanistic and Cultural Studies. His lectures in the city became very well known among the intelligentsia. Then, for twenty years from 1973 to 1993, Maharaj was President of Ramakrishna Math, Hyderabad, where he founded an ashrama on land provided by the Andhra Pradesh government. There he undertook various rural development programmes and stirred the people of that city with his brilliant and profound discourses on Vedanta. At the Government’s urging Maharaj gave yearly talks to trainees at the National Academy of Administration, first at Delhi in 1956 and after that at Mussoorie, for many years. He also regularly addressed cadets at the National Defence College, Delhi. Generations of administrators and bright minds destined to lead the country heard his wonderful expositions on Indian values and how they could be implemented in administrative fields. He served as a member of the Indian National Commission for cooperation with UNESCO during 1964-67. Between 1956 and 1972 he went on several world tours as an ambassador of religion and Indian culture, travelling to over fifty countries in North and South America, Asia, Africa and Europe, including the then Communist states of USSR, Poland and Czechoslovakia. During these government-sponsored tours, he lectured regularly, tirelessly and brilliantly. Universities, colleges, schools, cultural institutions, clubs and small groups of interested people all received something solid from him. From 1973 to 1986 Maharaj undertook annual tours to the US, Europe and Australia spreading the message of Vedanta and Ramakrishna-Vivekananda. Never confined within the limits of race, language or nation, his consciousness was always international and universal. So his audiences, be they learned or ordinary, young or old, immediately connected with him. He loved - and dared - to discuss the challenging contemporary problems in the light of eternal values and Vedantic concepts and drew appreciation from one and all - from savants to servants. His national tours, which took him to all kinds of institutions were as demanding as they were enlightening. He was proficient in several languages and was instrumental in starting many new Ramakrishna Math and Mission centres. He also helped and inspired other organizations and individuals to start ashramas where Swami Vivekananda’s practical Vedanta could be practised. Following the policy that Swami Vivekananda laid down for the Order, Swami Ranganathanandaji always remained apolitical; yet statesmen and politicians of all creeds and affiliations, including rebels, came to him for sage advice. He worked for national integration at all levels, bringing politicians and administrators, industrialists and technocrats, educationists and students, scientists and professionals, doctors and lawyers, businessmen and workers, and even children to believe in their country, to stop exploitation of every kind, and to work for the amelioration of the poor and the downtrodden. Maharaj never kept any money with him; whatever money came to him was spent on charitable and social service schemes that helped humanity, either through the branch centres of the Ramakrishna Mission or other philanthropic organizations. For all his towering public stature, he was still an utterly simple, honest, humble and loving person. During the 1943 Bengal famine he collected and shipped 1,250 tons of rice from Karachi. He also raised over Rs 1.5 lakh for the Mission’s relief work among the victims of civil strife in Bengal and Bihar, and cholera victims in Kerala. Revered Maharaj saw that India was on the threshold of a great revival due to the advent of Sri Ramakrishna, Sri Sarada Devi and Swami Vivekananda, and he energetically spread their message. He was a constant traveller and an unrelenting karma yogi of the highest order who never thought twice about foregoing food and sleep to help people selflessly. In appreciation of his noble contribution as an integrator of humanity, he was honoured in 1985 with the first Indira Gandhi Award for National Integration. Swami Ranganathanandaji was elected a trustee of the Ramakrishna Math and a member of the governing body of the Ramakrishna Mission in 1961. On 1 April 1989 he was elected a Vice President, and on 7 September 1998 he became President of the Order. It was as Vice President that he commenced giving mantra diksha, spiritual initiation, and over 60,000 people were formally initiated by him into spiritual life over the next sixteen years. From 1998 onwards he lived at Belur Math. All through his life, in addition to meeting his demanding schedule of travelling, lecturing, meeting people and attending to the details of administration, Maharaj found time to read and write extensively. He was a voracious reader and kept up the habit of serious study till the end of his life. All his talks and writings bear the stamp of deep thinking and scholarship. His intellectual outlook and austere habits concealed a very kind and large heart that was extremely sensitive to the sufferings of the poor and the downtrodden. He was deeply involved with the welfare of the weaker sections of society and women, and actively helped in their uplift. He was also greatly concerned about the need for conscientious political leadership. Last year he sent out two booklets, Vivekananda: His Call to the Nation and his own Enlightened Citizenship and Our Democracy, to all members of the newly elected Indian Parliament and Legislative Assemblies. 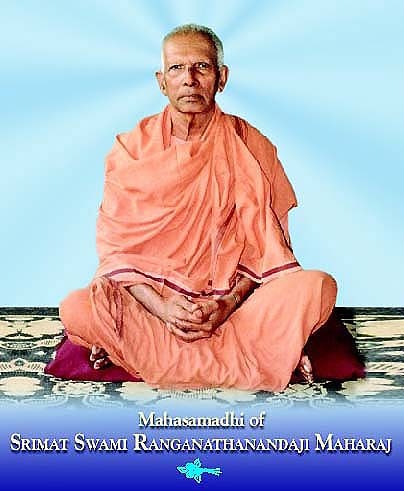 A large number of Swami Ranganathanandaji’s lectures have been published in book form, notable among which are: The Message of the Upanishads, Universal Message of the Bhagavad Gita (three volumes), The Central Theme of Srimad Bhagavatam, The Message of the Brihadaranyaka Upanishad, Eternal Values for a Changing Society (four volumes), A Pilgrim Looks at the World (two volumes), Vedanta and the Future of Mankind, Social Responsibilities of Public Administrators, Enlightened Citizenship and Our Democracy and Spiritual Life of the Householder. His 600 audio tapes and 50 video tapes on various spiritual topics and cultural themes, including scriptural talks, discourses on Sri Ramakrishna, Sri Sarada Devi, Swami Vivekananda and Vedanta, and lectures on science and religion, are a great source of inspiration. His lectures and talks were in simple and beautiful language, and so are his books. He used to himself edit and proofread his books - a habit he never gave up, despite his failing health. On his demise, condolence messages were received from Dr A P J Abdul Kalam, President of India, Dr Manmohan Singh, Prime Minister of India, Smt Sonia Gandhi, President, All-India Congress Committee, Sri S M Krishna, Governor of Maharashtra, and Sri T N Chaturvedi, Governor of Karnataka. Sri Gopalkrishna Gandhi and Sri Buddhadev Bhattacharya, Governor and Chief Minister of West Bengal, also paid their homage. Messages also poured in from many other Indian and foreign dignitaries, officials, organizations and individuals from different walks of life. Sri I K Gujral, former Prime Minister of India, and Sri L K Advani, former Deputy Prime Minister of India, wrote articles in eminent dailies about their association with Revered Maharaj and his great contribution to the social and spiritual welfare of humanity. On the 26th, the Rajya Sabha and Lok Sabha (the upper and lower houses of the Indian Parliament) paid homage to Revered Maharaj by standing in silence for a short while as a mark of respect to his memory. The press, All-India Radio and Doordarshan gave extensive coverage. Newspapers in Bangladesh also published the news of his demise prominently. The sun sets to rise again. The sun called Swami Ranganathananda has set only to rise in the hearts of thousands of disciples, devotees, friends, admirers and well-wishers who will work out the inspiration to fulfil the vision of all-round peace, prosperity and progress that Most Revered Maharaj instilled in them. I am saddened to learn about the passing away of Swami Ranganathanandaji, the Swamiji of indomitable spirit and a great spiritual leader. Swami Ranganathanandaji was a noble soul who immersed himself into the mission of spreading the message of the Vedanta to humanity spread throughout this planet. I fondly remember my meeting with him during my visit to the Belur Math in October last year. Kindly convey my condolences to all the members of the Ramakrishna Math and Ramakrishna Mission. I pray to the Almighty to give all of you the strength to bear the loss of this noble spiritual leader. 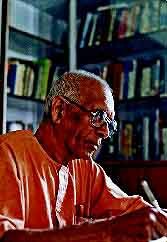 It is with deep sadness and a profound sense of loss that I join millions of our countrymen in expressing my sincere and heartfelt condolences at the passing away of one of the greatest teachers of our times, Swami Ranganathananda. Swamiji was a teacher, a scholar, a sage, a companion of the needy, and above all a deeply religious person and a true humanist in the best traditions of our ancient culture and civilization. He was also a builder, having created and built new centres of learning and meditation for the Ramakrishna Mission at home and abroad. Generations of Indians have sat at his feet and imbided the teachings of some of our greatest texts and epics. He was, without doubt, the most poetic and philosophical interpreter of the Gita in living memory.